Macadamia nuts on a wooden spoon. 3 Do Almonds Ever Go Bad? Macadamia nuts, native to Australia, are grown primarily in Australia, Hawaii and southern California, as well as other tropical areas such as Central and Southern America and some areas in Africa. The nuts are very high in oil content and are usually sold after they have been shelled and dried. Macadamia nuts are also sold roasted or roasted and salted. Freshness in macadamia nuts is dependent on storage procedures from the time they are harvested until they are eaten. Macadamia nuts are harvested after they fall from the tree and should be husked within 24 hours after they fall, according to the United States Department of Agriculture Agricultural Research Service. Drying normally takes place in ambient air, followed by a gradual increase in temperature that should not exceed 140 degrees Fahrenheit. Once the nuts have been dried, they must be protected from moisture and oxygen, so they are packaged in impervious material. Dried macadamia nuts should be protected from moisture throughout the storage process, as moisture makes the nuts lose their crispness and shortens storage life. Oxygen will cause rancidity if the exposure is prolonged. If you store macadamias on the shelf in your pantry, they will be edible for two to four weeks, according to the Still Tasty website. Once you open the original packaging, place the nuts in an airtight container or resealable plastic bag to protect them from air and moisture. 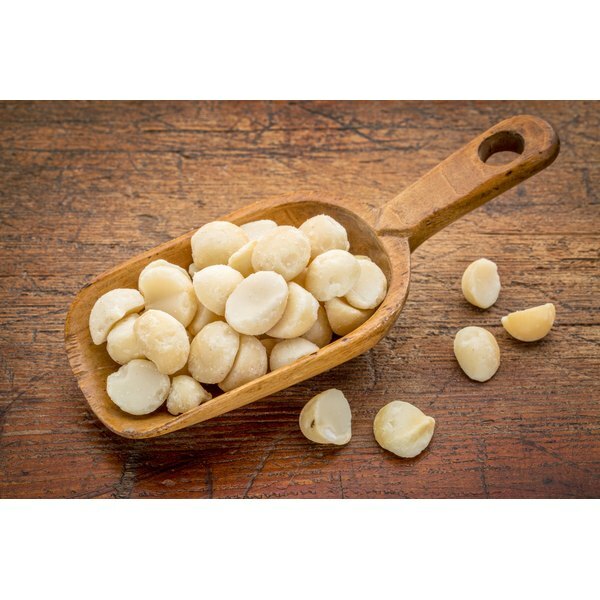 Although cold storage is not necessary when macadamias will be eaten within a week or two, if you want to store your macadamia nuts for an extended period, cold storage or freezing will extend shelf life. Refrigeration extends the shelf life to six months and frozen macadamia nuts will keep for nine months to one year, according to the Still Tasty website. Package the nuts to prevent air from getting into the package and use a moisture-proof storage container such as a plastic freezer container or heavy-duty freezer bag. If you choose to freeze macadamia nuts, thaw them slowly to prevent moisture condensation and loss of crispness. Macadamia nuts are in high demand, according to the California Rare Fruit Growers Association, which notes many people consider them to be the best tasting nut. The price, which is often double that of nuts such as cashews, reflects the high demand and relatively low supply. Storing your nuts carefully will ensure that you get your money’s worth and that your nuts will provide you with the best possible taste and texture. However, if your nuts have an off flavor or odor, they should be discarded no matter how carefully they were stored.